Discussion in 'Vaping mods Reviews' started by BombVapes, Sep 23, 2015. Hello folks! Thank you for joining me on another BombVapes review. Today has me taking a closer look at the all-new Pioneer4You iPV3 Li Temperature Control Mod from GearBest.com. Built on a solid platform (the iPV3), Pioneer4You's iPV3 Li takes the tried, tested, and very much loved build quality and aesthetics of its predecessor, and throws temperature control into the mix; something that's quickly taking the vaping community by storm. Packed full of features, it certainly looks good on paper, but let's see how it holds up to closer inspection. The iPV3 Li 165W by Pioneer4you is one of the most feature packed box mods in today's market, combining 165 Watts of adjustable power, temperature control functions, and a ball locking sliding door, all at an incredible price! Utilising two 18650 batteries (not included) , the iPV3 Li uses a YiHi SX330V3SL Chip, providing incredible accuracy and range, firing resistances from 0.1 to 3.0 ohms with adjustments from 10 to 99.9 Watts in increments of 0.1 Watts, and 100 to 165 Watts in increments of 1 Watt. 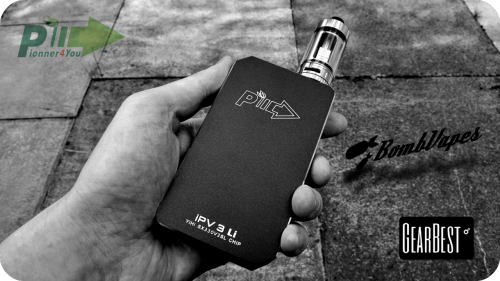 With efficiency ratings of over 95%, the iPV3 Li is truly the current pinnacle of regulated box mods. Fully integrated temperature control is also present, with adjustments from 212 to 572 degrees Fahrenheit, firing temperature mode resistances down to 0.05 ohms. Manufactured out of Aluminium, the iPV3 Li features a dovetail sliding door with a ball locking mechanism. A spring-loaded brass 510 connection makes adjustment and atomiser connection consistent and hassle free. Utilising the Micro USB port, user's will also have the opportunity to upgrade the iPV3 Li to 200 Watts once the firmware update becomes available.